Waterfront Luxury Home. Hot Tub Heated Pool. Central Location.Golf Cart Access. Enjoy indoor-outdoor living in Fort Lauderdale with our newly built luxury contemporary 4 bedrooms / 4/1/2 bathroom Waterfront Town House. Designed in a luxury style with 4 floors, elevator, roof terrace with outdoor kitchen and amazing 360-degree view, This home comfortably accommodates up to 10 guests The kitchen is fully equipped. This home has all the conveniences you want while on vacation, including wireless internet access and laundry facilities and a street legal Golf Cart which you can park in front of the beach on reserved parking lots. 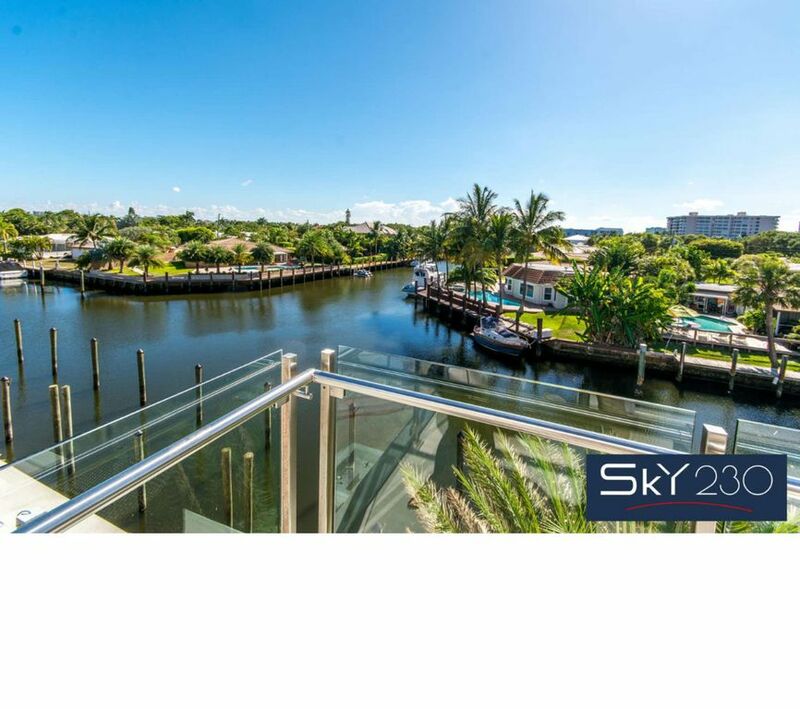 Located on the Intercostal Waterway in a quiet family friendly neighborhood of Fort Lauderdale by the sea. This residence has a boat dock and is just 0.2 miles from the beach and close to everything including shopping, restaurants, and nightlife. The Town House comes with a Golf Cart and a free Parking direct in Front of the beach. A new luxury vocation townhome in Lauderdale by the Sea, Fort Lauderdale's trendy beachside community, comes along once in a lifetime. Coupled with a unique fourth floor rooftop terrace boasting both ocean and intercoastal views three blocks from the beach, dining and boutique shops, this opportunity becomes even more extraordinary. A golf car comes together with the town House, you can park for free direct in front of the beach on reserved parking lots. waterfront town home designed to exude finesse, sophistication and luxury. The home incorporate a myriad of opulent features that distinguish them as palatial architectural marvels. Outstanding features such as four level elevators and soaring ten foot ceiling heights promote an ambiance of grandeur and elegance. What a beautiful place this was to stay. Not only was the house itself absolutely gorgeous, but the bedroom views & rooftop deck made it that much better. Our hosts were super accommodating to us & would check in to make sure we were loving our stay! It’s a short distance from everything we did over the weekend & the golf cart provided made it that much easier to travel places. I would happily book this vacation home in the future! The manager Alicia is available 24/7. The rental includes a golf cart, which is awesome! The condo is so close to the beach you can walk easily but the golf cart was so helpful to bring chairs etc. Gorgeous property! This property is a fabulous place to stay! Starting from the first contact to book until the day we checked out. Alicia was super to work with she answered all questions throughout our trip. The home is beautiful and clean. Wish I lived there year around!!! The kitchen was well stocked! Loved the balconies on each level. The home was close to restaurants, beach, shops etc... perfect location! Will stay here again! We have just returned from 6 nights at the beautiful Lauderdale-by-the-Sea. The house is in a perfect location, just a stroll from all the restaurants and the beach. It’s a beautiful modern house - we were a party of 10 (6 kids) so could use the pull out couch to accommodate us all. The pool is small but really lovely and very warm! The views from the master bedroom are stunning. Thank you for making our trip so memorable. Most Amazing Vacation Home Ever! This was our 8th annual trip to Fort Lauderdale in February and this home was by far our most enjoyable stay ever. The accommodations, the amenities, the cleanliness, the convenience, the beauty! Alicia was incredible with making the check-in process easy and answering our questions - no matter how late in the day or how silly. Thank you Hermann and Melanie for allowing our families to stay in your beautiful home. We hope to book again next year and will be in touch today.